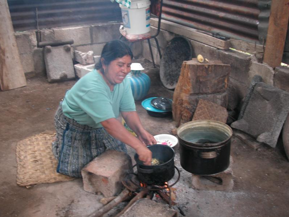 A typical Mayan kitchen is damp, dark, soot and smoke filled. The women kneel on the dirt floor in front of an open flame. They place their containers on rocks or blocks in the fire. Most women suffer from eye infections and respiratory problems as well as most children. There is inadequate ventilation. Like most homes, a Mayan kitchen is the center of the home. Most meals and conversations take place there. Servants 4 Him is helping to change this with the addition of fuel efficient stoves. Fire wood is becoming a major problem in Guatemala. Deforestation has contributed to mudslides and erosion problems. 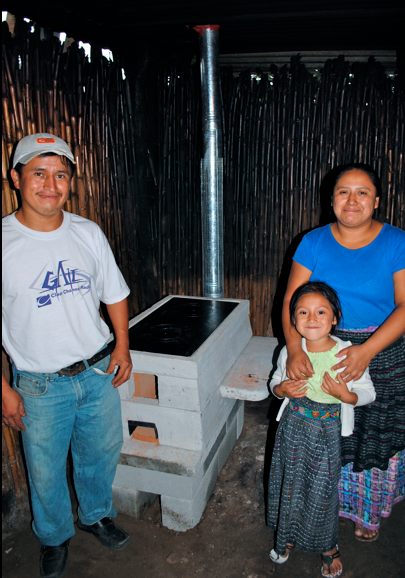 These new stoves use 50- 70% less wood, benefiting not only the family but the country as well. When a family receives a new stove it is frequently put into a “new” room. The stoves cook longer and hotter using less wood than on open flamed fire. They are built at waist level so that the women can stand while they cook. The addition of wide sides allows the family to use it as a table as well. The chimney removes all the smoke and women are finally able to keep their kitchens clean. Like the filters we use a similar analogy with the stoves; before a new stove their lives were covered with soot and smoke, just like a life without Christ. With a new stove their kitchens are clean, just like their lives when they come to know Jesus Christ. It is a simple illustration but readily understood in the Mayan culture. S4H is constructing improved stoves (estufas mejoradas) with concrete blocks and bricks similar to the Guatemala Stove Project stoves. We are also installing Eco-Comal, Eco-Plancha, and Eco-Concina stoves as well as Onil Stoves that we purchase from Helps International here in Guatemala.